From finishing third on The Voice in 2012 to seeing her second single “God Made Girls” go gold in 2014, garnering two CMT Music Award nominations, touring with Miranda Lambert and Rascal Flatts, and releasing her single “Love Triangle” in July 2016, country singer RaeLynn moves at a hectic pace. But despite her busy lifestyle, RaeLynn, 23, takes time to manage her Type 1 diabetes, which she has done since her diagnosis at age 12, the same age at which she discovered her love of country music. This past summer, she joined Novo Nordisk’s Patient Ambassador Education Program, taking part in community and educational events around the country on behalf of Novo Nordisk. Having just wrapped up a two-month U.S. tour with her Voice coach and mentor Blake Shelton, RaeLynn spoke to Diabetes Self-Management about her passion for both country music and helping others with diabetes. DSM: You were diagnosed at age12, the same year you discovered al ove for country music. Coincidence, or are they somehow intertwined? 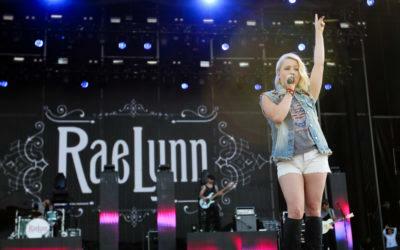 RaeLynn: I grew up with music always a part of my life. Everyone in my family can sing. When I was diagnosed at 12, for sure it was kind of a scary thing. When you are told you have to take a shot every day, you think the world has ended. But I was taught that it was totally manageable, that I could handle it and still live out my dreams. My parents wanted me to be able to take care of myself. I went to nutrition classes — the biggest adjustment was going from eating sugar to eating sugar free. If there ever is a right time, now is the time to have diabetes. There are so many recipes, ways to manage it, apps to track food, etc., it’s absolutely incredible. DSM: How did your diagnosis change — or not change — your lifestyle? RaeLynn: For sure it changed my perspective. At 12, I was seeking approval from my friends. I was nervous. I always felt my diabetes was a bother to people. If we went to the movies and I was feeling low, I was nervous to tell my friends I needed to grab a candy bar. When dating, I was always nervous about taking shots in front of a date — I didn’t want them to think I wasn’t cute. DSM: Currently, how do you manage your diabetes? RaeLynn: I use the NovoLog FlexPen ,take long-acting and fast-actingi nsulin in the morning and Novo-Log during the day. You have to work with your doctor to find whatever works for you; every patient has her or his own way of managing diabetes. DSM: How do you manage your diabetes while on tour and when performing on stage? RaeLynn: When I’m performing, I generally get up 5:45 AM, check my sugar and make sure everything is OK, and take my long-acting insulin, even if it’s too early to be hungry. I workout for at least 30minutes; it makes me feel good. On the road, I check my sugar more often. Before I go onstage, I always check it. And I always have OJ and water on stage if I need it. I’ve never had a problem performing. When I come offstage, I always check my sugar again. I’ve known Blake [Shelton] for years, he’s like family to me. If anybody makes sure I check my sugar, it’s Blake. DSM: Tell me about the launch of The RaeLynn Diabetes Foundation. RaeLynn: We are planning a big launch. The main reason I wanted to start this foundation is that while I was fortunate enough to be able to pay for medical care, take classes, and learn about diabetes, some kids don’t have those advantages and opportunities. I want to be able to bless a child by paying for a pump or insulin or covering doctor bills. I want to be able to have an impact on kids, or grownups, with diabetes — to offer help to anyone who needs it. I can’t wait to see this take off. DSM: Let’s talk a bit about your advocacy work with Novo Nordisk. What motivated you to get involved as a patient ambassador? RaeLynn: Novo Nordisk was looking for somebody in my field, young and on the road, with a different lifestyle than the other ambassadors. We clicked instantly — I love everyone at the company; they are amazing people doing incredible things. To be able to talk about my experience is just second nature for me — it’s something I’m passionate about. I’m thankful they reached out to me and that I can standup and be a voice for Type1 diabetes. DSM: Novo Nordisk and JDRF have anew six-book series designed to guide children and their caregivers through the different ages and stages of life with Type 1. You helped launch the series in July at the Children with Diabetes Friends for Life conference in Orlando. How was that experience? RaeLynn: I signed autographs at the Novo Nordisk booth and gave out these books. The reason I love these books is that each is geared to a different age group — written in a playful manner for young children, talking about taking shots in front of friends for elementary school ages, dealing with dating for teens. I think these books are genius. This whole conference is absolutely incredible. People come from all over the world. I didn’t know about this conference as a kid; if I had, I definitely would have come. When you meet someone with Type 1 diabetes, you immediately have so much in common, and you become friends for life. Connecting with other kids with Type 1diabetes is so special. DSM: What’s next for you? RaeLynn: I released my single “Love Triangle” in July 2016, which I wrote at 18. It’s about something I went through as a child of divorce. So I’ll be going to a lot of radio stations this year, focusing on that. As a patient ambassador for Novo Nordisk, it’s my goal to connect children, teens, and young adults who have Type 1 diabetes with the resources they need to get through these important years. I want to show them that you can still achieve big things with diabetes. Diabetes shouldn’t hinder them from following their dreams. I am living proof. Want to learn how other celebrities are living with diabetes? Read about James Earl Jones and Nick Jonas.